bonjour dear blog friends, how are you? i hope you’re doing well. it’s been a long hiatus but i’m back with a new perspective on all things old. so where oh where have we been, you and i? well truth is that i’ve been here all along, just working behind the scenes since i truly needed a break from the technological side of life. taking time off from tech taught me a lot about what it was to live again instead of dreading the things i once loved. if you follow this blog you know it’s been a struggle to ‘find time’ to be creative and enjoy the little things like photography and writing. so what’s changed? well let’s see…i started to pull back from all the excesses and minimize in every way. this gave me a chance to really look at what was important as far as what and who is in my world. After paring down the physical stuff like excess clothing, papers and clutter, it left one thing, the people. what’s funny is that it opened up the opportunity to forge closer relationships with my friends and family who are now not only a part of my private life, but also a part of my work life too. in fact, they’re now going to be helping with research and development of The Paris Apartment and they’ve taken on tasks like digging deeper into areas i’d previously skimmed over. case in point, we’re learning a lot about some of the little pieces we brought back from paris and are starting to understand what they are and where they’re from. for example, this little pillbox may not have been a pillbox at all. 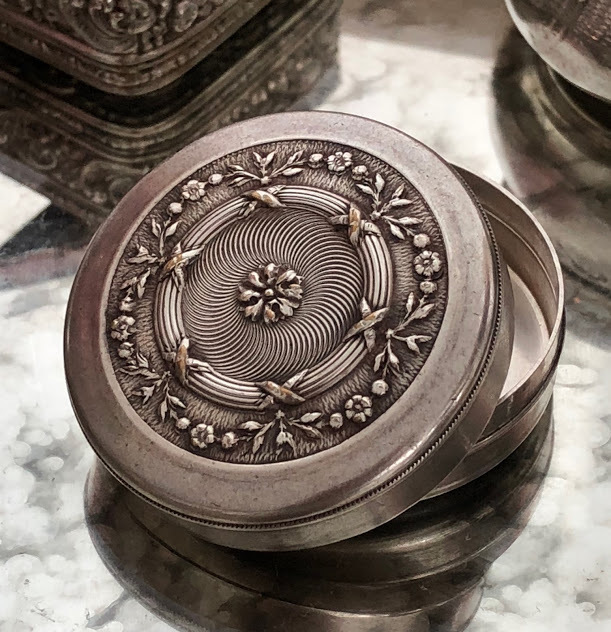 in fact, my sister in law, jean found out that they’re often called ‘patch boxes’ and were where the french would sometimes keep those small black dots we see on the faces of the fashionable men and women of the past. 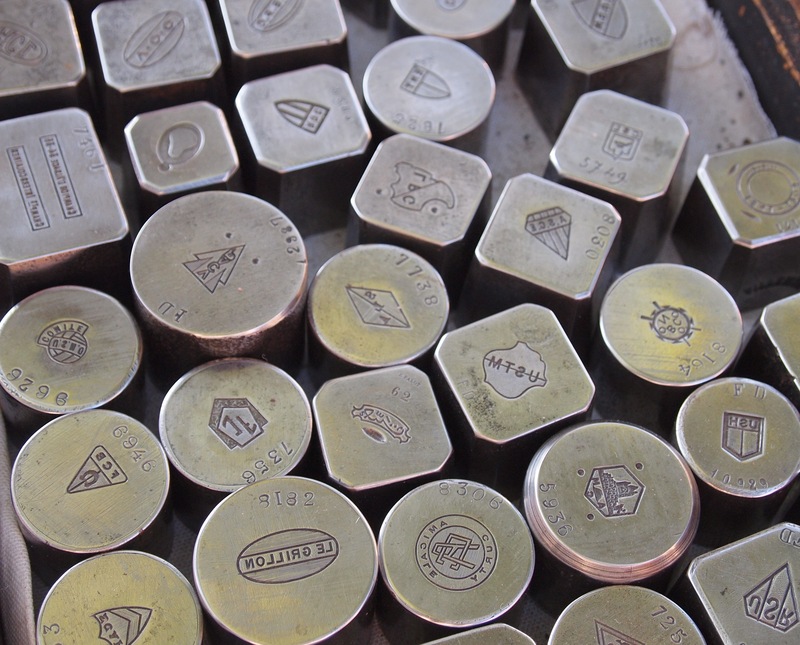 beyond that, she discovered the meanings of some of the hallmarks that are pressed into the silver and gold and that each has significance. 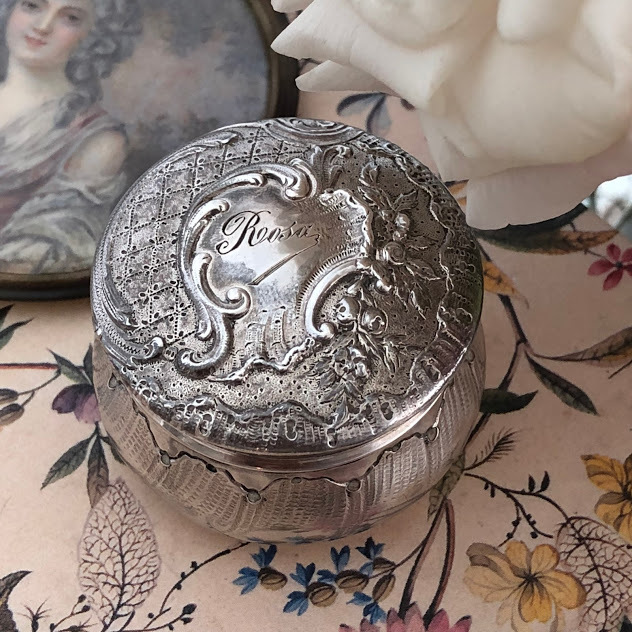 on this little sterling box, were two marks on the underside, one of an anvil, signifying the maker’s mark, in this case, paul canaux who was in operation in the 1800s: Paul Canaux, a manufacturer jeweller-silversmith, active at 30 rue des Francs-Bourgeois in Paris succeeded the silver-plater Joseph Mégemond and entered his mark on 9 August 1888. Paul Canaux based his sponsor’s mark (an anvil as symbol) on that of his predecessor Mégemond. 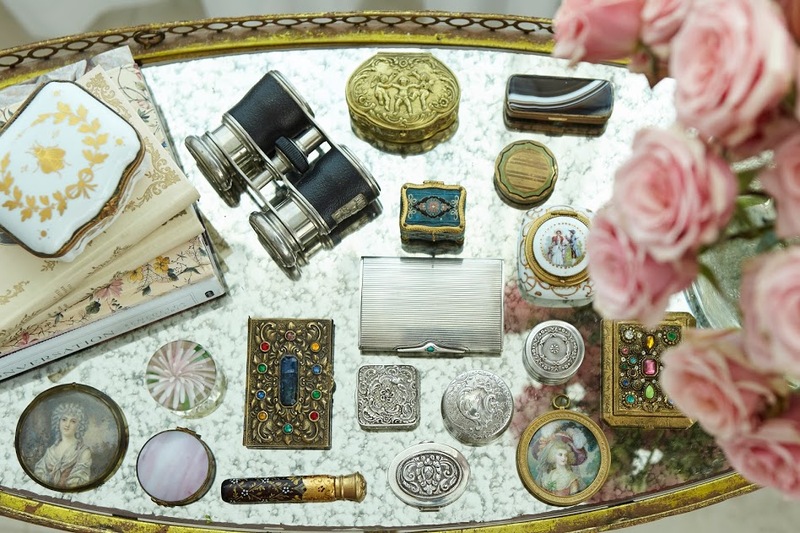 He was a manufacturer of silverware, cutlery, tea sets, centerpieces, serving dishes, etc. His maker’s mark was struck off on the 12th of April 1892 and at the same date a new maker’s mark “PC & Cie” was registered, as the house changed its style to Paul Canaux and Company. The Makers Mark is for ‘Maitre Orfevre’ Paul CANAUX and shows a P and a C separated by an anvil. Paul CANAUX registered his mark on August 8th 1888 and cancelled it on April 12th 1892. He was succeeded in 1892 by his sons under Paul CANAUX & Compagnie. 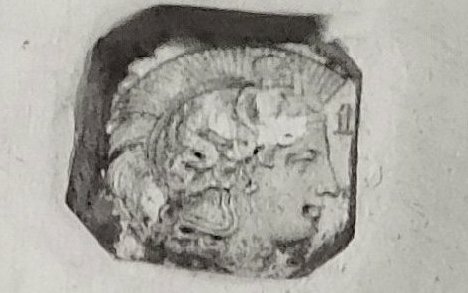 she also discovered the other mark referred to the amount of silver contained in the piece was and still is known as a ‘tête de minerva‘ (head of minerva, referring to Roman goddess) a mark which ranges from the 1st to the 2nd percentage. 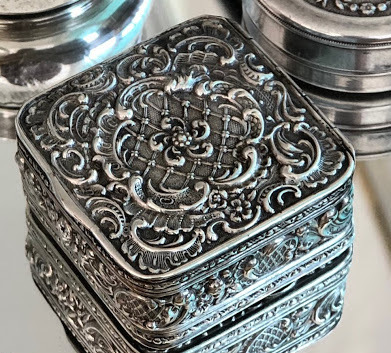 the french standard for silver is higher than most other countries and requires at least 95% silver to be of the first caliber (the 2nd is just 80%). our little box marked ‘Rosa” is of the first quality. 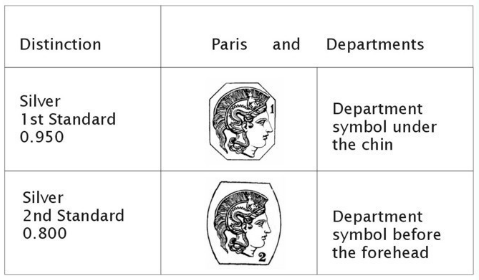 and can be identified with the symbol below, always in an octagon (the second is in an oblong square). 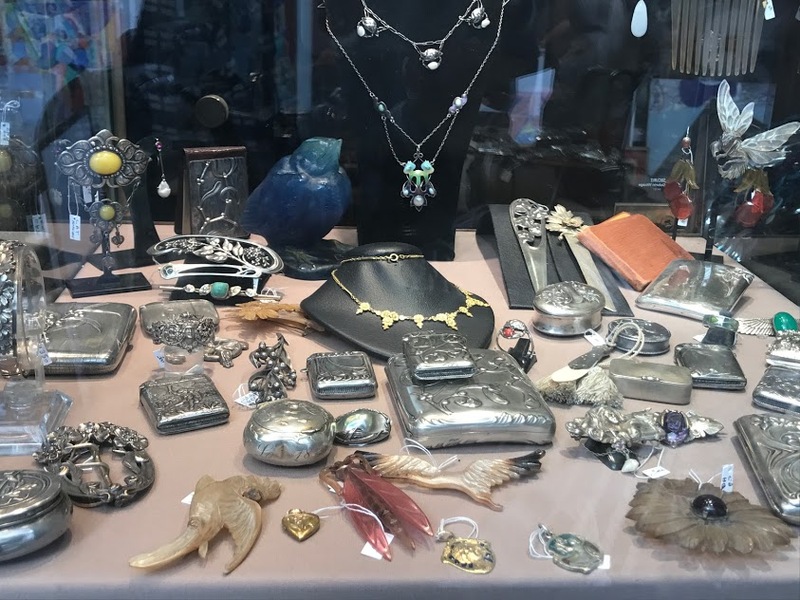 the best part about it is that many of the gold and silversmiths set up shop in the marais on the very street where we often stay in paris, making it even more fun to learn about who is behind so many of the pretty little things we often overlook. 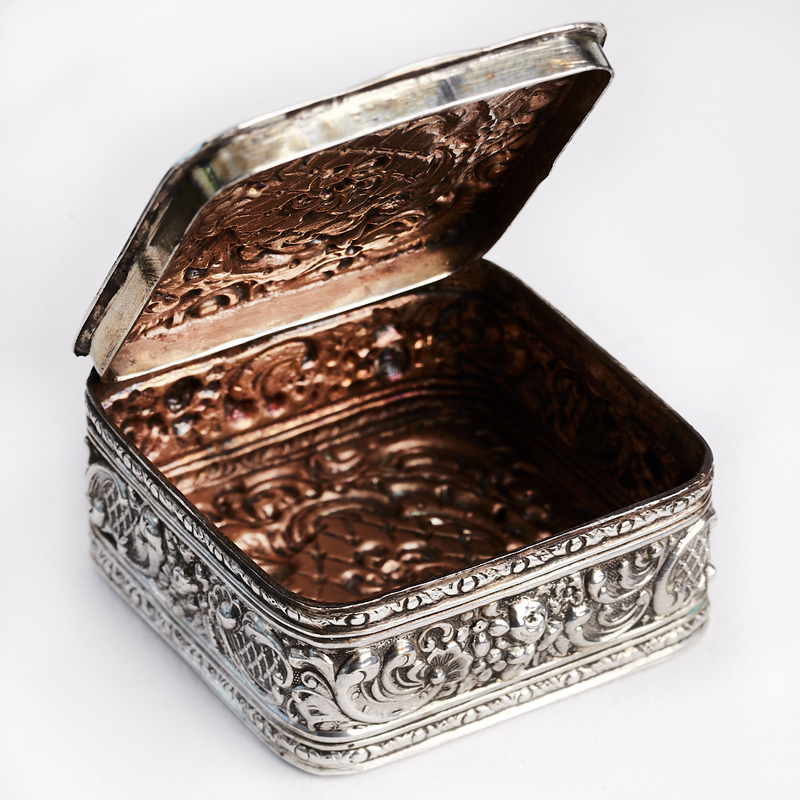 this little box below is one i’m obsessed with for its intricate beauty. it’s so exquisitely detailed that it’s almost a meditation whenever i hold it. who created it and how? when i’m trying to created something i think about the patience and creativity it took to make this by hand with such precision and perfection. 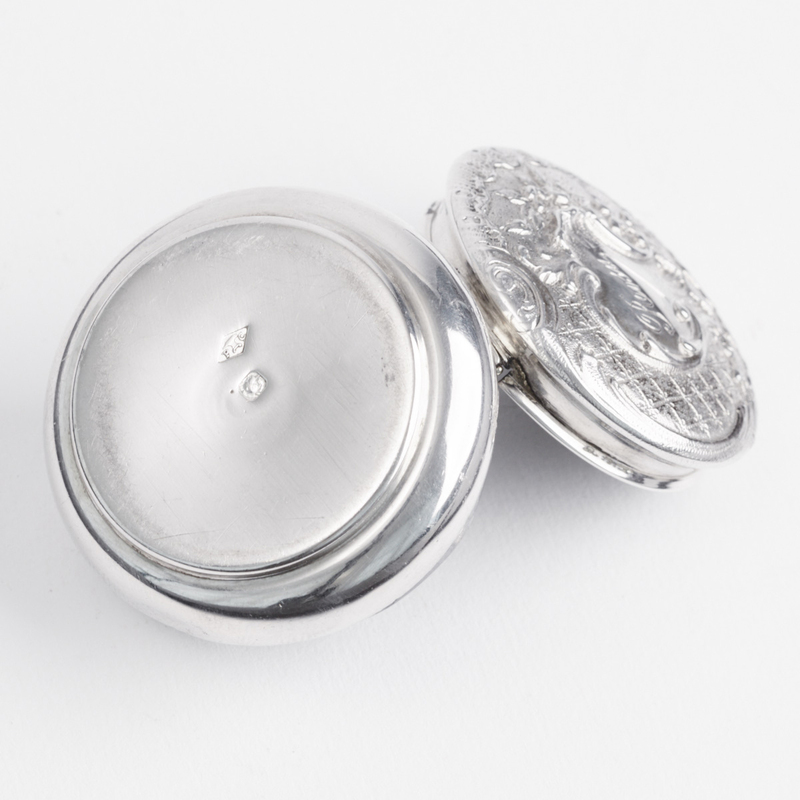 as we’re researching we found that there are two small circles on the inner lid with tiny swans inside. the meaning is a little unclear but it seems that the swans signify silver articles of unknown origin coming into france around 1864. meaning this was made sometime before then but it’s undocumented up to that point. you can see the tiny scratch marks on the lip where the creator must have used a very fine tool. the inside is almost a gold hue making me think that it’s not all silver but there’s no way to tell the full percentage. the truth is that this society was very complicated and there are books and historians who go into great detail about the marks that range from rhinos to owls. 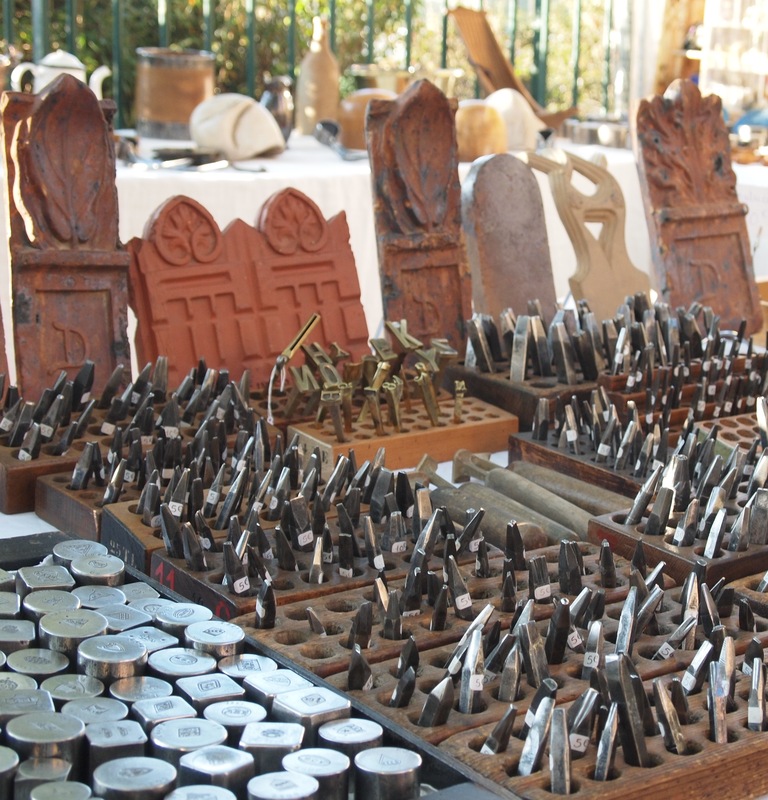 at the paris markets we often come across this vendor at vanves who sells metal tools and iron stamps. these may not have been used on the boxes per se but they give us a look into what it may have been like to forge these tiny gems that we see among the scattered tables each weekend. So glad you are back! I just returned from Paris, taking friends in a ‘tour, before taking off on my own . I will be returning in May for an oil painting workshop in the country , near Avignon. I have become obsessed with medieval history in France after discovering my roots through Ancestry. It makes travel that much more interesting . The strong women in that time were keeping everything together while their husbands were off crusading. 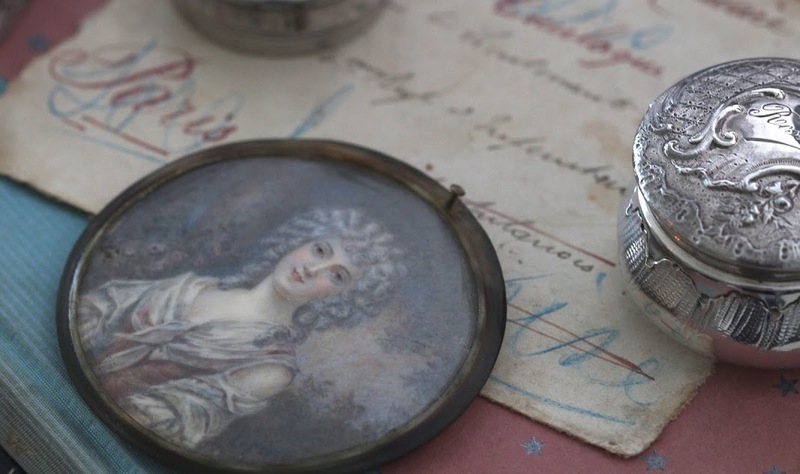 Your research and sense of beauty combined make for such a beautiful blog….especially your photography, your past life or DNA are absolutely rooted in the French esthétique. I love that you are back and with some support from your family and friends. November 26, 2018 at 4:38 pm. Permalink. Dear Nancy, hello! Thank you so much for your note, you made my day! I love hearing that you’re painting and learning about your ancestry. You’re so right that things take on a deeper meaning when we find our connections to people and the lives they led and the things they used. I’d love to hear more about your adventures! November 30, 2018 at 8:06 pm. Permalink. I am a Francophile from America who so enjoys your posts. I too have French heritage from the Alsace area, and am interested in your research on all things French. So happy to see you are back! November 26, 2018 at 5:08 pm. Permalink. Hi Dorothy! Wonderful to hear from you, i’m so glad you stopped by and are also interested in so many of the fascinating history the French had. I’ll check out Alsace as I don’t know much about that and would love to learn about it. November 30, 2018 at 8:15 pm. Permalink. I am an Australian here i love your posts i love your aoartment and thise little bixes are exquisite so glad to see you back. November 27, 2018 at 6:31 am. Permalink. Hi Julie, that means a lot to me, I’m glad you’re here. PS I am obsessed with the boxes! November 30, 2018 at 8:22 pm. Permalink.